A MEMORIAL has been unveiled at Colin Glen Park for a local woman who died after being struck down by a scrambler in July last year. Valerie Armstrong, a mother-of-three from Poleglass, had been in the Forest Park walking the dog when the incident occurred. A 17-year-old male has been charged in the wake of the death with causing death by dangerous driving and having no insurance. Volunteers at the Princes Trust spent two months preparing the memorial, located by Mila’s Lake. Princes Trust team leader, Francine King, explained: “Basically the Princes Trust was holding a community project around the time of this tragic incident. “We decided we wanted to do something and we had this old boat and agreed to refurbish it for this purpose. “There were eight young people involved in the programme and they got involved by sanding or preparing the boat in some way for today. “In all it took around two months, mainly because of the break in the programme. Park ranger Paul Bennet helped up with the logs and made sure that everything was done basically. The programme lasts over 12 weeks for the young people but they can volunteer after. 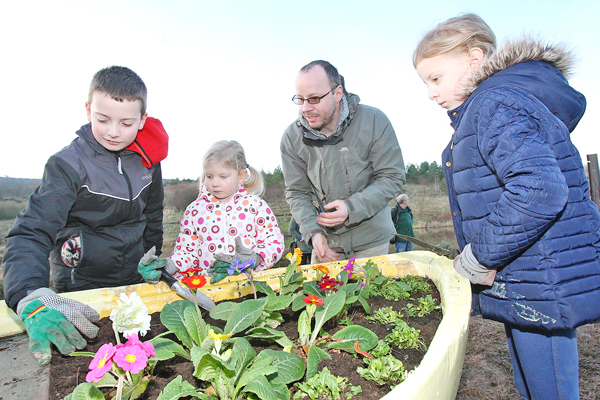 Seamus Armstrong and the couple’s three young children donned their wellies and gardening gloves to plant some flowers in the refurbished boat on Monday afternoon. Much-loved family pet Kaya the husky attended. “The family really appreciate the effort that the Princes Trust put into the memorial,” Seamus said. “We said originally any memorial was going to have to be purple as purple was Valerie’s’ favourite colour, so its good to see that’s been included. “I saw the boat before it was done and it’s definitely come a long way, they’ve done a great job. There have been lots of groups getting involved along with the Princes Trust like the Colin Neighbourhood Partnership.